Luxury apartments in DAMAC Properties’ AYKON City project overlooking the new Dubai Canal have gone on sale for the first time. The release of the units within the 60-storey residential tower follows the successful launch of hotel apartments within the development. In a first phase, two bedroom units will be up for grabs from Saturday, 11 June at Jumeirah Emirates Towers in Dubai with prices starting at AED 1.69mn ($460,000). 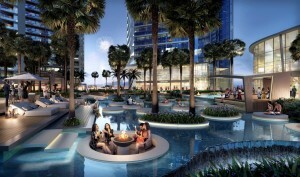 Sales will simultaneously take place in Abu Dhabi at Jumeirah Etihad Towers. The project will include AYKON Dare, the next attraction for thrill-seekers in Dubai, with breathtaking views from 935 feet (285 metres) above Sheikh Zayed Road, Safa Park and the Dubai Canal. AYKON Dare will provide guests a rare opportunity to walk around the outside of the tower’s roof for a real adventure and with panoramic views of the city. The total project sales value of AYKON City is AED 7.4bn with a completion date of 2021.